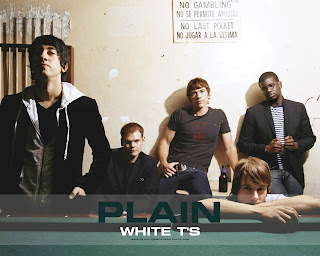 The other day I was listening to the radio when I caught the tail end of a an interview with the lead singer of the band Plain White T's. He was talking about their latest single 1 2 3 4 which I had never heard. The only song I knew that they had done was "Hey There Delilah" which I have always liked and even have on my newish Ipod shuffle. I thought I would check out the video to their new song on youtube and it was love at first listen. It is such a sweet, happy love song. The video is also pretty cute too. You can watch and listen to it here. I tried to put the video on my blog, but just couldn't get it to work. Tomorrow morning Isabel and I are heading out to a flea market. Problem is, I have no money and I really shouldn't go. I did get some housework done today so that is how I am justifying the play time tomorrow. I am so thrilled to see all the entries on my 200th post giveaway.There is still time to enter so make sure to leave a comment on that post to be eligible. Drawing the lucky winner on Monday AM! I love this song....can't get it outta my head!! It is a "Happy" song...thanks Lisa! I fwd it to my daughter who is getting married...great wedding song, din't cha think? What a delightful song. Need to download to the Ipod to help enhance the speed of my morning walk. I had to go to playlist.com to listen because I love the Deliah song. This is so cool! Thank you for sharing it! I am also going to send it to my son and future daughter-in-love for their wedding. Thanks for the link!! I love that song!! It even made me cry, but I am seven months pregnant, so most everything makes me cry!